"Perfect for entertaining, this has all the flavours of the festive season." 1. Preheat the oven to 180C. Stud the blood orange with cloves and bake for 30 minutes. Put the apple juice cinnamon stick, nutmeg and maple syrup in a large saucepan. Bring to the boil, add the baked blood ornange, reduce the heat and simmer for 5 minutes. 2. Pre-warm the punchbowl usig hot water. 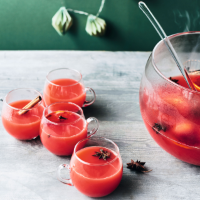 Remove the punch from the heat and stir in the pineapple, lemon and blood orange juices. 3. Pour into the bowl and ladle into heat-resistant glasses. Garnish with sliced orange and star anise.